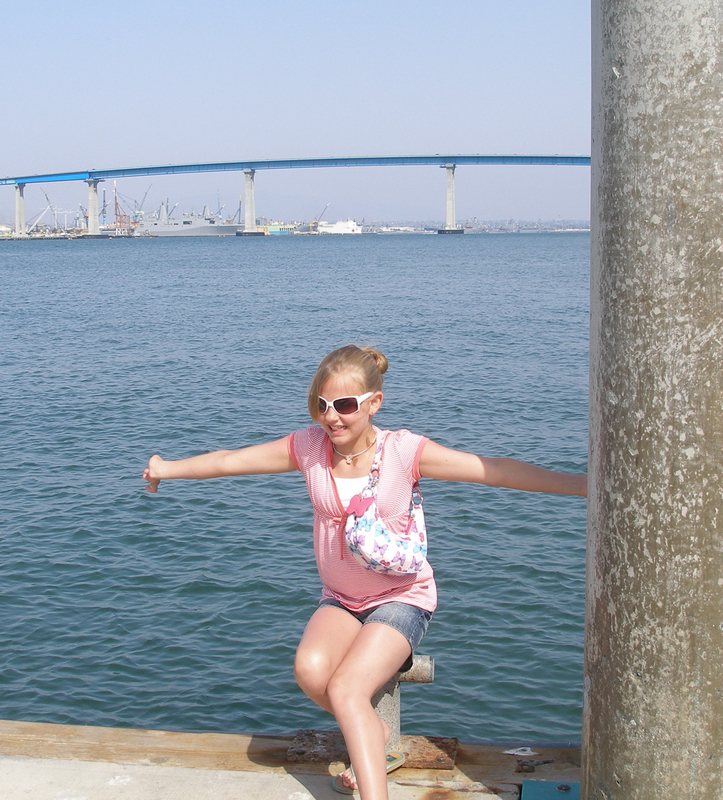 I went to San Diego a couple of years ago for a conference and it was around Spring Break for Elyse. Her big brother was off doing something else, and being a Sagittarius just like my Mother, Elyse is afflicted with wanderlust, and was wanting to go someplace fun for her break. So my Mom decided to take her, my sister and myself to Coronado Island and treat for an extended weekend at the Hotel Del Coronado right after my conference. Elyse had turned 12 a few months earlier, and this was one of her first trips without Ian. So I was a little concerned that she might get bored without him, since we weren’t planning on doing anything but relax at The Del. But she loved the water and easily made friends, so this wasn’t a stumbling block at all. Besides, she and my sister were swimming BFFs, and there was so much to do at The Del. Laying by the pool and swimming had its fun moments, unfortunately there were no kids around the first day and I could tell she was getting a little bored, but I knew she would never say anything. I had noticed that The Del gave surfing lessons. I casually suggested this to Elyse (who is an awesome swimmer) and she jumped at the opportunity. We went and signed her up for two morning classes for Saturday and Sunday. And she would be in a group of 10-15 year old kids, so maybe she could meet some kids for the weekend to hang out with at the beach or the pool. 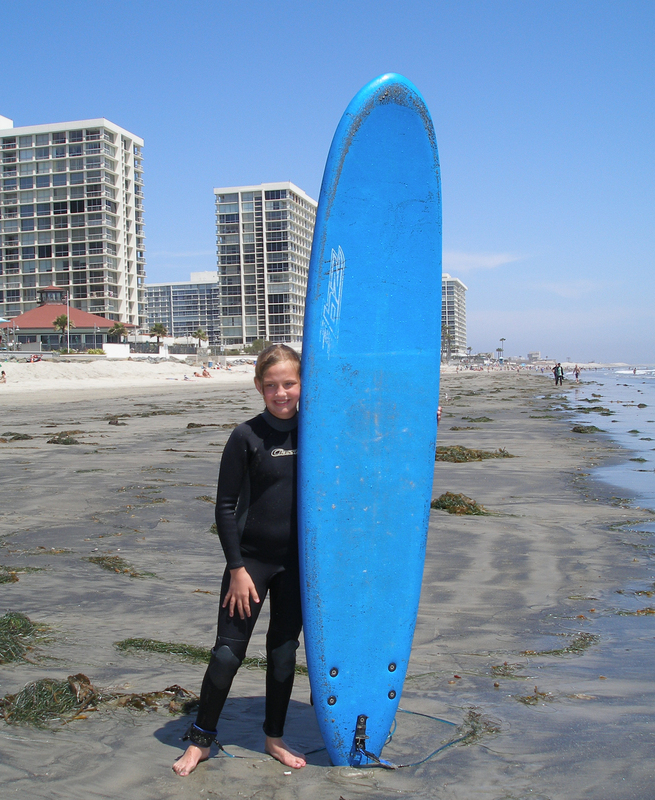 She took to surfing like Gidget on just the first day! In fact better than Gidget! (Baby Boomers reading this will know who Gidget is of course!) Elyse listened intently to the instructor and was up on the board catching the waves in no time at all that first morning. She absolutely loved it and had so much fun. And she was excited to tell her friends at school that she learned to surf over Spring Break. The class was just three hours long, and afterwards, she came over to where I was reading on the beach and sat down next to me. 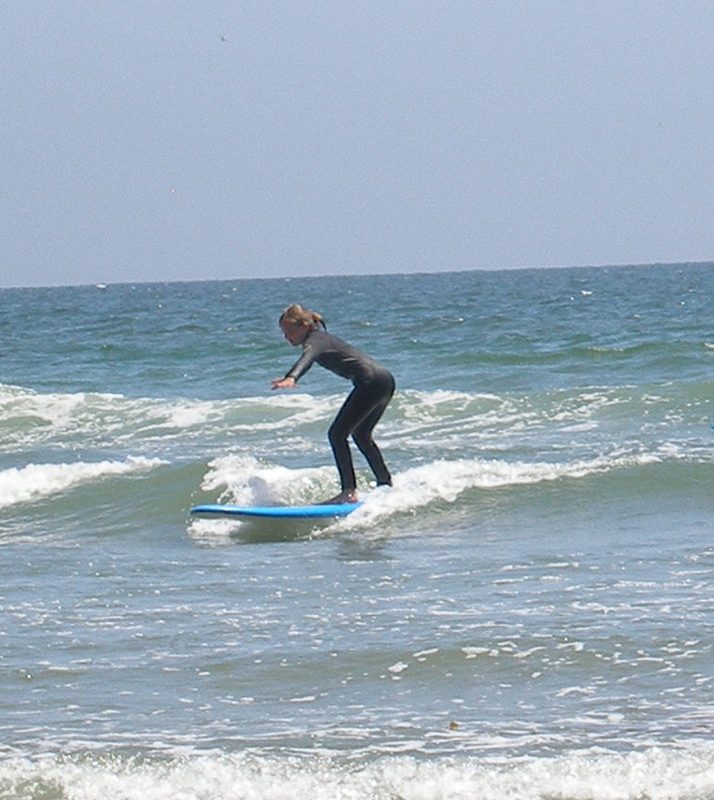 We had some lunch and Elyse shared with me the thrill of surfing and how that was now going to be her new sport. I reminded her that she lived in the heart of the Midwest, and that probably wasn’t practical. After just a handful of attempts, Elyse was up on the surfboard in no time at all! While eating our lunch, there were some kids on the beach building a really awesome sand castle and on later inspection it was actually a sand fort. They had dug this huge hole and were building a fortress around it. One of the boys working on the fort had been in Elyse’s surfing class and he was about a year or two older than her. 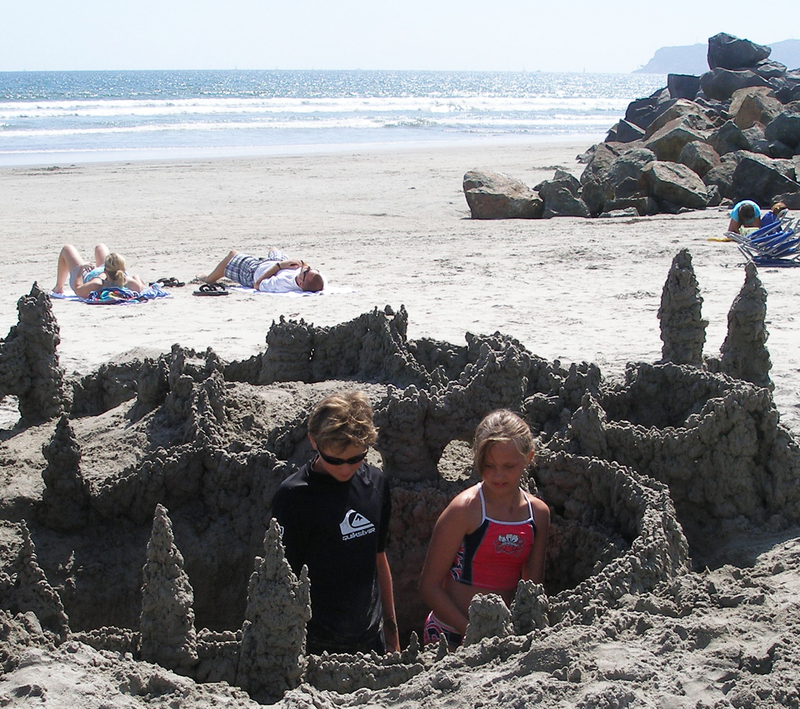 She said to me, “don’t you think that boy is cute?” I agreed and suggested she go down and help them with their fort. Surprisingly she got very shy, and said no it would be too awkward, and what if they didn’t need her help or what if they wouldn’t talk to her? She giggled, got up to do it, then ran back and said “I can’t do it.” I was somewhat perplexed by this new shyness, as she’s always been confident around other kids, including boys, and never had a problem meeting new people. Then I realized she was being shy because this kid wasn’t just any boy, but because like Gidget, she had found her Moondoggie (except she was a junior Gidget and he was a junior Moondoggie!). I gave her a few words of encouragement, and told her there were girls around him, probably his sisters, and to talk to all of them instead of speaking just to him. She walked back down in the opposite direction, casually turned around, and started strolling back in the direction of the kids on the beach building the sand fort. In no time at all, Elyse had said hi, told them they really had a cool fort, asked if she could help, and then was inside the fort digging out sand and forming a wall while standing right next to her Moondoggie. As I suspected, the other girls did turn out to be sisters and cousins. And Moondoggie turned out to be a very nice boy named Brendon. They were from Arizona, and their family was also on Spring break.